By bringing together a variety of academic accounts from mostly European countries on factors inciting, restricting, straining, training, discouraging and encouraging gay and lesbian family practices, and presenting research findings previously not available for English speaking audiences, Doing families contributes to the still ongoing epistemological and moral debates about the meaning(s) of family life. The book is about lesbian and gay families – or more precisely: about specific frameworks within or without which family practices of gays and lesbians can be lived and interpreted in Denmark, Finland, France, Germany, Italy, Spain, Sweden and the United States. Following David Morgan’s active and practical approach that sees family “less of a noun and more of an adjective or, possibly, a verb”, Doing families focuses on how lesbians and gays are ‘doing family’ besides doing class, gender and a lot of other things all at the same time. During at least the last two decades one of the main questions of family sociology has been whether, borrowing Judith Stacey’s term, we are brave enough for doing brave new families. The authors of this book certainly believe so. This volume is extremely timely. By highlighting important disparities in the ways which gay and lesbian families are regulated, this collection raises crucial questions about the project of a united Europe. Indeed, common phenomena are now occurring all across the continent. However, for political and sometimes religious reasons, the rights to which these families are entitled vary considerably, and several countries are still trying to ignore a growing social reality. Against this backdrop, this book undoubtedly enriches our knowledge. It confirms that families are formed through social practices rather than legal frameworks and advocates letting go of legal fictions. 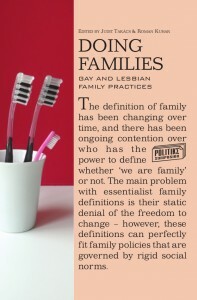 This book represents an important contribution to the understanding of the everyday life of gay and lesbian families. It shows how these families are created through everyday life itself where individual agency plays a crucial role with important effects not only at the micro but also at the macro social level. By its diversity in topics, the book provides new information and the latest perspectives on everyday life realities. It will be of particular interest to various audiences, from students and researchers in social sciences to activists and policy makers and above all to gay and lesbian families themselves. This volume certainly stands on its own as a valuable contribution to both family studies and LGBT studies. 5. Homoparentality in Italy: Myth of Stigmatisation?